Optimising buildings using a holistic design process can achieve supreme energy and environmental performance and optimal indoor environmental quality. Advanced computer tools are used to optimize the building design to achieve the lowest initial costs and the lowest life time costs for the client. 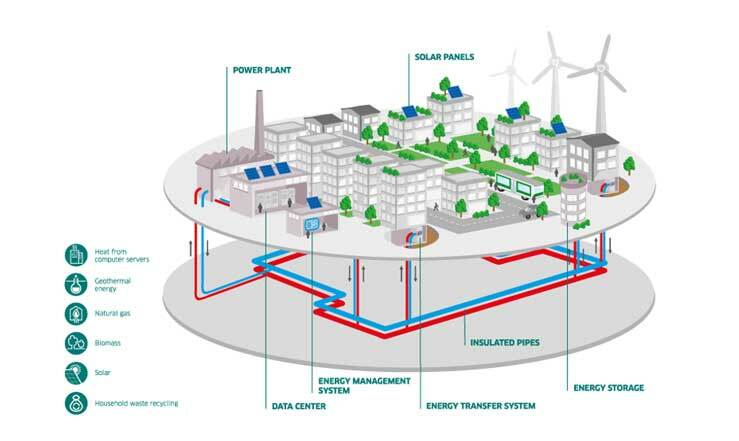 District cooling system (DCS) provides cold energy to multiple buildings that are strategically located within the region of a centralised cooling plant. The DCS eliminates the need for big capacity individual chillers in every building. Instead, centralised chillers/district cooling plant that is capable of cooling whole buildings will require only 2-3 big capacity chillers that often come at a lower price compared to having multiple chillers in every building. The chilled water price offered is comparatively lower than the electricity price used to generate chilled water in individual buildings. Furthermore, a careful design of the whole DCS system can reduce the dependency on fossil fuel and lifetime cost. We offer the most cutting edge technologies that are capable of optimising the whole system’s efficiency which will increase the chilled water production per fuel input, reduce thermal losses when transporting the chilled water from the DCS plant to the consumer, reduce the thermal losses during storage and reduce the environmental impact of which the combined benefits will result in higher profit for the plant owner. This design objective will be achieved through detailed analysis of available resources, high capacity thermal energy storage, low losses transportation liquid, high efficiency chillers and demand management to optimise resources and reduce losses. Meanwhile, for the consumer, DCS will massively reduce the cost for air conditioning systems, offers lower energy prices to supply thermal comfort to the buildings’ occupants and ensure a more sustainable future via the use of renewable energy and higher efficiency system’s.